Krispy Kreme is getting in on Talk Like a Pirate Day again this year with a tasty grub giveaway. On September 19, any buccaneer who dares to enter a participating Krispy Kreme location talking like a pirate gets one free Original Glazed doughnut. To the lad or lass wearing full pirate attire goes a bounty of one free dozen Original Glazed doughnuts. 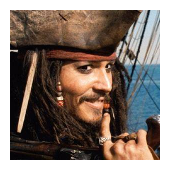 · Talk like a pirate or wear an eye patch to a participating Krispy Kreme shop for one free Original Glazed doughnut. · Come to a participating Krispy Kreme location in full pirate costume for one free dozen Original Glazed doughnuts. No weapons allowed!